Is this a Stones record? Do you know anything about the record shown? As you see there is nothing mentioned on the label who this is. It sounds like the Rolling Stones, but it’s probably not. Same song on both sides. 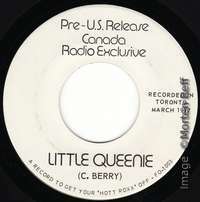 Morten bought this 45 on eBay from Canada in early 2012. The Stones did actually play in Toronto 4-5 March 1977 in a small club but according to their set list they didn’t perform ‘Little Queenie’ (though they did ‘Around And Around’). It’s live all right, and although the singer tries his best to sound like Mick Jagger, towards the end the guitarist plays riffs that are very different from Keith or Ronnie. So, is this a bootleg of some sort pretending to be the Stones or is it a Stones cover band trying to fool us, or what? Can anyone help out there? As far as we know about the Toronto gigs, the Stones did not play Little Queenie at El Mocambo. The set list of day 1 (4.3.77) is not completely known, though. After listening to the recording, I am 100 per cent sure that these are not the Rolling Stones. I also doubt this is one of the typical cover bands. It sounds as if they took the Stones' version from Get Yer Ya Ya's Out as a guideline.